TODO: Check: are there smarter alternatives ??? at "usbdev - dynamic dev symbolic link and proper access rights"
fixed in 4.1.3, 4.2 branch, and >= 4.3.0. In general a command and its possible response e.g. HELP is sent/retrieved from the master to the ATMEL with e.g. ERRx <Error number> <Error description> *** "<Additional Information>"
ERRx "<Command>" <Error number> <Error description> *** "<Additional Information>"
A : api errors, e.g. typos, wrong arguments, inputs, syntax, out of limits, etc. 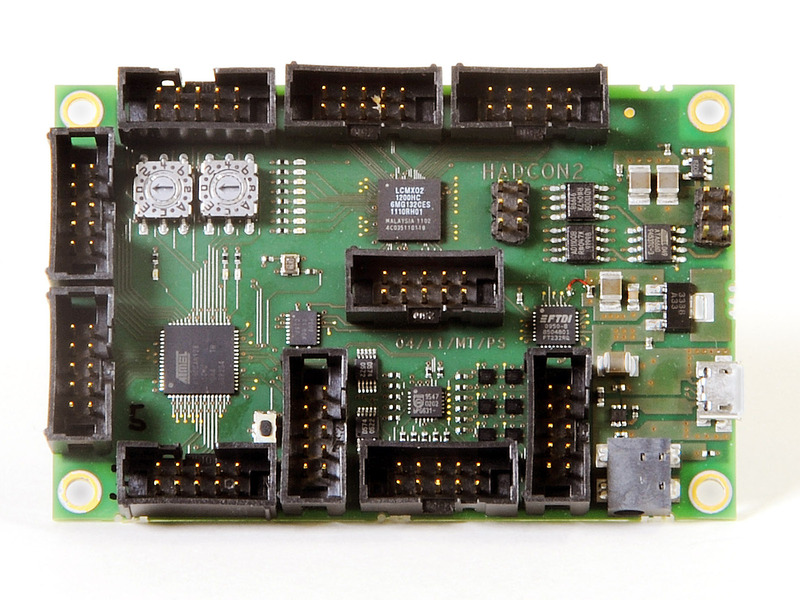 The SPI command set allows to operate the Serial Peripheral Interface SPI interface of the HadCon(2)'s microcontroller, (currently "only") as a master. It sends data in atomic chunks of bytes via the MOSI pin to slave devices and receives via the MISO pin the responses. This happens in a buffered mode, so that multiple bytes can be send and received at once. The current limitation of the write-buffer is linked to the input string buffer of 140 characters, i.e. &approx; 60 bytes. The received data is stored in a read buffer which is of the same size as the write buffer. The purging of the buffers depend on the mode of operation and the configuration settings. All necessary steps are taken automatically, optional behavior can be achieved by changing the configuration. setting the defined chip-select pin(s) to "active low"
release the defined chip-select pins(s) to "passive high"
The user can prepare step by step the write buffer before automatically sending it. The user has full control on setting and releasing chip select pins. SPI cs_set                // set all available chip select pins to "active"
SPI cs_release            // set all available chip select pins to "passive"
SPI cs_set 01             // only activate 1st chip select pin to "active"
SPI cs_set fe             // only activate the other chip select pins to "active"
SPI cs_release ee         // set masked chip select pins to "passive", keep 5th "active"
SPI cs_release 10         // set masked chip select pins to "passive", keep 5th "active"
sets (selected) chip select pins to "active low"
releases (selected) chip select pins to "passive high"
The chip select mask allows to select a subset of the available, defined chip select channels. Each bit of this mask represents a channel which can be selected or ignored. This mask is used in all cases where chip select actions are required and not explicitly given. Allows to add up to 8 output port PORTX:Pin combinations to act as channel select channels. Provided the chosen slots aren't used yet or the address set is already defined (see SPI cs_pins, SPI cs_remove_pin). Removes a chip select configuration from set of pin configuration (see SPI cs_pins). A successful operation is reported via SPI cs_pins. Allows to set/get the combined information/settings of the SPI Control Register SPCR and the SPI Status Register SPSR en bloc. Therefore those two registers are combinded into one 16bit data word with SPCR as LSB and SPSR as MSB. Since SPSR, despite its name, does have one control bit. all settings can be done alone using the functions described below. Success is reported via its get mode and the get functions of the seperate properties. "When the SPE bit is written to one, the SPI is enabled. This bit must be set to enable any SPI operation." "When the DORD bit is written to one, the LSB of the data word is transmitted first. When the DORD bit is written to zero, the MSB of the data word is transmitted first. " "This bit selects Master SPI mode when written to one, and Slave SPI mode when written logic zero. If SS [the 'Chip Select Pin'] is configured as an input and is driven low while MSTR is set, MSTR will be cleared"
"When this bit is written to one, SCK is high when idle. When CPOL is written to zero, SCK is low when idle." "The settings of the Clock Phase bit (CPHA) determine if data is sampled on the leading (first) or trailing (last) edge of SCK." "These two bits control the SCK rate of the device configured as a Master. SPR1 and SPR0 have no effect on the Slave. " "When this bit is written logic one the SPI speed (SCK Frequency) will be doubled when the SPI is in Master mode. This means that the minimum SCK period will be two CPU clock periods. When the SPI is configured as Slave, the SPI is only guaranteed to work at fclkio/4 or lower." exception: after a power up, channels are set to 0V. In case you are using the command DAC , you will get the above for each channel from 0 to 7 in a separate line. <0|1> : used to execute write or read operation. This is the Least Significant Bit (LSB) from the I2C address byte. <I2C address> : Here has to be written the hexadecimal value on the address byte, which is shifted to right with one bit. The reason for the right shift is because, the lsb bit ist already used in the first field, where the working operation is choosen.